Our 2019 calendar is a vibrant photographic celebration of the things early people left behind on the Eno. The Eno River community was once alive with farms, homes, roads, and mills. As they left the forest grew around the relics they left behind. Today those relics inspire our imagination as we walk the woods. We hope they also inspire you to join our extraordinary journey to save more of the places you love along the Eno and its tributaries. A huge thank you to our many fine Triangle retailers who support the Eno River Association and the community through their efforts. The calendar is also available at the Association office at 4404 Guess Rd., Durham. Call 919.620.9099 or click here to e-mail for more info. Eno River calendars are $13 plus sales tax. 2019 Calendar Contributors – a huge “Thanks” to our community of photographers, artists, & writers! …support the work of the Eno River Association: buying and protecting land, advocating sensible public policy, providing environmental education and doing our best to make this a better world for all of us. Thanks to Brian Schmidt of BJS Design Studio for substantial and sustained support of the Eno River Calendar. 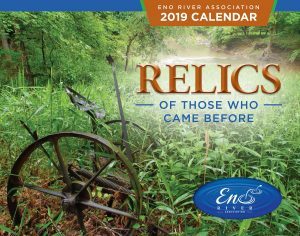 A limited number of calendars from previous years are available at the Eno River Association. Some are for sale, while others remain in our archives but can be read or viewed by those who are interested in learning more about the Eno. The delightful 1990 Cookbook Calendar is only $1 and full of old-timey recipes. Call or stop by to see the calendar archives.